Coming to the National Gallery of Art in 2018 | Ciao Washington! 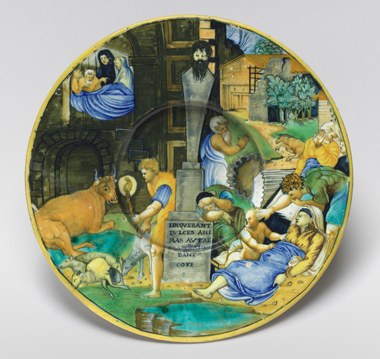 Inspired by the acquisition of the important William A. Clark maiolica (glazed Italian ceramics) collection from the Corcoran Gallery of Art, and drawing largely on the Gallery’s newly expanded holdings, this exhibition brings together some 90 objects to highlight the impact of Renaissance prints on maiolica and bronze plaquettes, the two media most dramatically influenced by the new technology of image replication. Focusing on designs by major artists such as Andrea Mantegna, Antonio del Pollaiuolo, Raphael, Michelangelo, Parmigianino, and Albrecht Dürer, the exhibition tells the story of how printed images were transmitted, transformed, and translated onto ceramics and small bronze reliefs, creating a shared visual canon across artistic media and geographical boundaries. The first exhibition of its kind in the United States, Sharing Images is accompanied by a publication that provides a comprehensive introduction to different aspects of the phenomenon, from the role of 15th-century prints and the rediscovery of ancient art to the importance of illustrated books and the artistic exchanges between Italy and northern Europe. The exhibition is curated by Jamie Gabbarelli, Andrew W. Mellon Curatorial Fellow, department of old master prints, National Gallery of Art, Washington. Organized by the National Gallery of Art, Washington.